Comment Otake was a servant of the Sakuma family in Odenma-cho in Edo. She never wasted even a grain of rice. She was spotted by a group of mountain ascetics who were looking for the incarnation of the Nyorai Buddha. As Otake bent down to collect rice grains, a light like a halo surrounded her convincing them they had found their buddha. Otake died May 19, 1680 and was buried in Asakusa at Zentokuji. 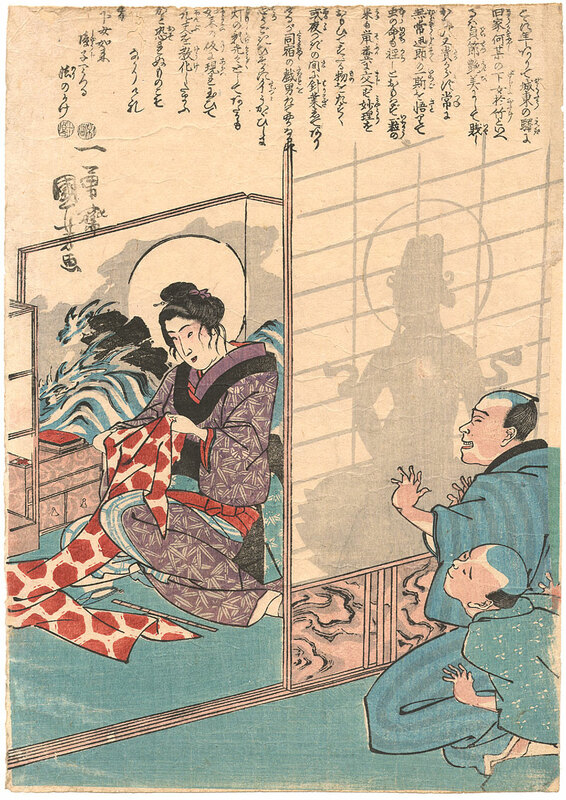 In this design, two men see a silhouette of the maid sewing behind a shoji screen. She sits in front of a screen with a full moon that gives the appearance of a halo.